Sharing pictures on social media is incredibly commonplace, but all too often, these photographs are quickly buried under other status updates and soon forgotten. The Timehop app is dubbed "a time capsule of you" because it automatically shows photos and updates you posted on the same exact day one or more years ago. The app is really easy to use and provides a convenient digital stroll down memory lane. 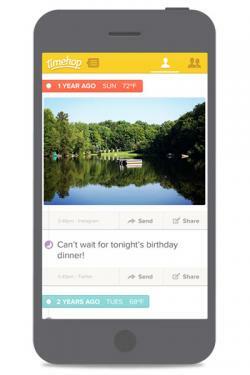 Timehop is designed as a mobile app for smartphones and tablets, so there is currently no official way to use it through a web browser on a computer. The app is available for Apple iOS devices as well as on mobile devices which run on Google Android. Timehop is very easy to use. Download and install the mobile app on your device of choice using the links provided above. Create a new Timehop account by clicking to connect to your Facebook account. You may need to log in with your Facebook credentials or click the "OK" button to allow Timehop to access your account. Grant access for Timehop to access your old photos. Proceed through the pages to connect other social networks to Timehop, including Twitter, Instagram, Swarm and Dropbox, as well as the photo gallery on your phone. You can also connect more networks through the settings menu at a later time. The app can now display moments that you shared one or more years ago on this exact date. Scroll your way down the timeline to see memories from further back in your history. To share any individual memory, tap on the "share" button just below it. This brings up a screen where you can further customize the share with stickers and alternate layouts. Choose to share the memory on Facebook, Twitter, Instagram or through other available services on your mobile device. You can also choose to share your memory via email or text message. A few simple tips will help you hit the ground running with this app. The latest version of Timehop, as of this article's writing in December 2015, is not compatible with the iPad. You can only connect one account per service, so if you have multiple Twitter accounts or multiple Instagram accounts, you will have to choose just one to use with Timehop. If you don't have a Facebook account or you don't wish to connect your Facebook account, you can still sign up to use Timehop through the app if you have a US-based mobile number. Beyond that, the sign-up process is identical. The optional alternate layouts and frames for sharing a memory include some where you can integrate a new picture with the memory and compare it with the old picture. If you've ever tried to remember what you did on your last birthday or how you celebrated certain holidays a few years ago, Timehop can provide an automatic glimpse into the past. You get new "stories" every day, and you can choose which ones you want to share with your friends. Best of all, Timehop is completely free to use, and your data is kept private and secure.